The earliest evidence of silat being taught in a structured manner comes from the Sumatra-based empire of Srivijaya where folklore tells that it was created by a woman named Rama Sukana who witnessed a fight between a tiger and a large bird. By using the animals’ movements, she was able to fend off a group of drunken men that attacked her. She then taught the techniques to her husband Rama Isruna from whom they were formally passed down. That Rama Sukana must have been a tough cookie, for pencak silat is one badass way of fighting. It’s so badass, that the characters in this film often prefer to use it instead of simply shooting one another. That is badass. Jakarta’s biggest crime boss, Tama Riyadi (Ray Sahetapy), has his headquarters in a huge apartment building, in which most of the units are rented out to criminals who work for him. Lieutenant Wahyu (Pierre Gruno) is a corrupt and not too bright police officer who orders a SWAT team to break into the building and capture Tama. This turns out to be not a good idea, since most of the cops are killed within a few minutes. One of the few who are left alive is Rama, played by Iko Uwais, who is considered one of the best pencak silat fighters in Indonesia. He and the other survivors must figure out a way to get out of this death trap. 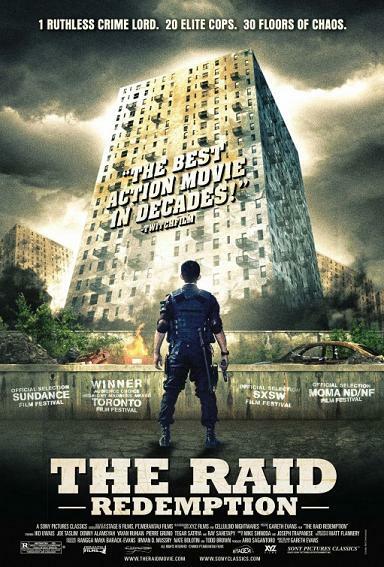 Although it has the requisite amount of double-crossing, The Raid: Redemption has a fairly simple story. It basically serves as an excuse for almost two hours of fight scenes. If you like martial arts movies, you will thoroghly enjoy this movie. If you don’t care for martial arts movies, not so much. Needless to say, I liked it.